Kuwait 1967, Kuwait 1990. Friendship, war and loyalties collide. The desert is burning. Can love survive? 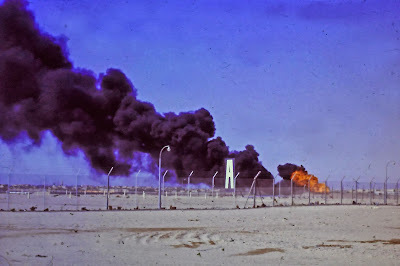 This is the well fire that Cleo and Robin watched Dynamite work on in the 1960s. This one fire shook the ground for miles around. The next chapter of 'Oil Town' will be out in a fortnight. Sally teaches yoga in Cambridge and Burwell (the fen-edge village). Her son Jon Lander sometimes contributes illustrations to this blog and was the inspiration for her previous blog Yoga with your Slippers on, illustrating it every week for 4 years. © 2013 Sally and Jon Lander . Simple theme. Powered by Blogger.